I'm marking my return to blogging after last week's hiatus with an exciting announcement: I have an article published in the June 2012 issue of FLARE magazine! (On page 136, to be exact.) If you want to flip around and read others before you get to it though, I don't blame you. The issue is filled with fun features like a stylish guide to London by Rebecca Tay, and an exclusive on Chanel's little black jacket and Karl Lagerfeld by Mosha Lundstrom Halbert. Unlike my last article (which was all about my mother), this one deals with social media and what can happen in online spaces when friendships sour offline. Not a pleasant experience perhaps, but a very universal one as I discovered while writing this story. Major thanks to editor-in-chief Lisa Tant for this fantastic opportunity, former managing editor Catalina Margulis for her thoughtful editorial suggestions, and current managing editor Maureen Halushak for ensuring the article went to press without a hitch. Oh, and another round of thanks to the experts and subjects who graciously consented to do an interview. It's on news stands now, so pick up a copy today. Enjoy! Congratulations! I just read the article and thankfully I've never experienced anything like that - but I can see how easily social media escalates things like that now a days! Yes, it's so important to pause before responding as the experts advised. Have a great time in Europe! Congratulations - it was such a great article! Wonderful. Congrats! And yes, a very universal issue worth discussing. Thanks! Glad you feel the same way about it. Your turn again next month! Lisa this is so wonderful! Congrats on the feature! 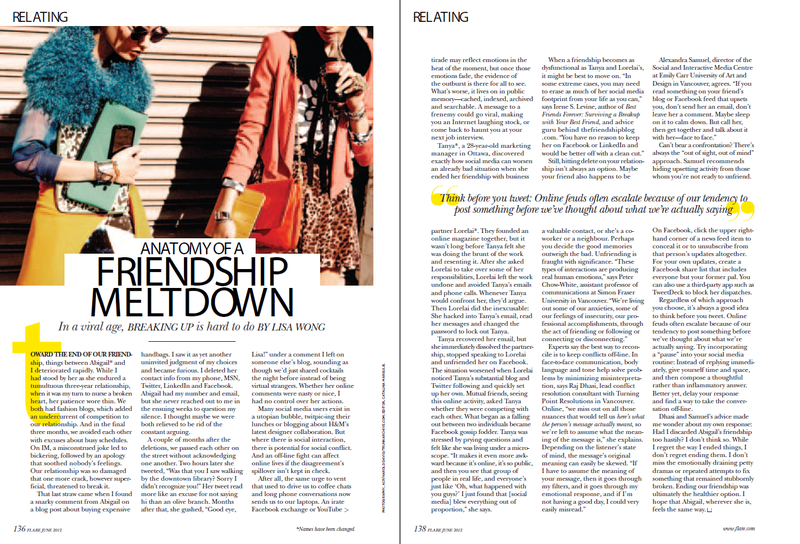 "We're living out some of our anxieties, some of our feelings of insecurity, our professional accomplishments, through the act of friending or folioing or connecting or disconnecting." So true at times, isn't it?! Just noticed a typo in my first comment, in the sentence below. Hope you can use this version instead! Thx. "We're living out some of our anxieties, some of our feelings of insecurity, our professional accomplishments, through the act of friending or following or connecting or disconnecting."